Do you like your museums with a touch of mystery? How about ones that are a part of unsolved crimes? What about those with eccentric co-founders? If you said yes to any of the above, we have the museum for you. The Isabella Stewart Gardner Museum in the Fenway-Kenmore neighborhood of Boston ticks all of those boxes. Not only was it founded by an eccentric woman who wrote in wacky bylaws that must, over one hundred years later, STILL be followed, but it was also the site of the largest property theft in US History. If all of that is not enough of an enticement, it is also home to priceless works of art and one of the most beautiful courtyards in Boston. Isabella Stewart Gardner was an American art-collector, philanthropist, and patron of the arts. She built the museum which opened in 1903 as a place for the public to enjoy her extensive collection of more than 10,000 pieces of art. Due to Isabella’s requirements, most of the art is unlabeled and the rooms have varying levels of lighting. This actually adds an air of intimacy of the space which feels more like an eccentric aunt’s home than a museum. You feel you are discovering the works as you move about the space and enjoy the interior garden courtyard. As you wander around the space you’ll notice empty frames. These held 13 paintings worth an estimated $500 million until they were stolen from the museum in 1990. The paintings were never recovered, and the theft remains one of the greatest unsolved art thefts in history. There is still a $10 million reward for information! Don’t miss them. Ready to go? 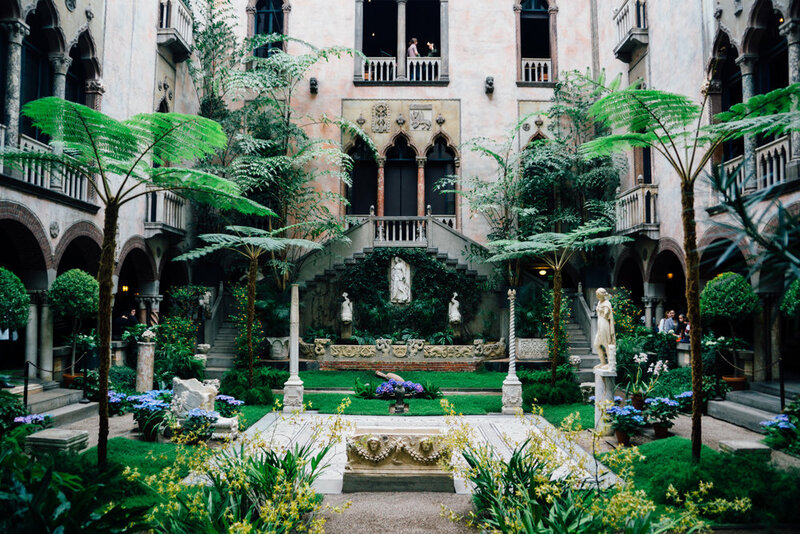 To get to the Isabella Stewart Gardner Museum, take the Green Line E train to the Museum of Fine Arts stop, or the Orange Line train to the Ruggles stop. There are also some free and metered parking spots in front of the museum and paid garage parking at the Simmons School of Management Garage near the museum. The museum is open Monday, Wednesday, Friday, Saturday and Sunday from 11 am to 5 pm. It is open late Thursdays from 11 am to 9 pm. The museum is closed Tuesdays. Regular admission is $16. Are you named Isabella? If so, you’re in luck. “Isabellas” receive free lifetime admission. Not named Isabella, but still looking for discounted tix? Wear some Red Sox gear for a $2 discount or go for free on your birthday! You can also check out a discount pass at your local Boston Public Library or Cambridge Public Library branch and pay only $5 to enter. The museum has awesome free events – concerts, open studios, yoga, tours, fashion shows, and more. Check their calendar to see what’s coming up.